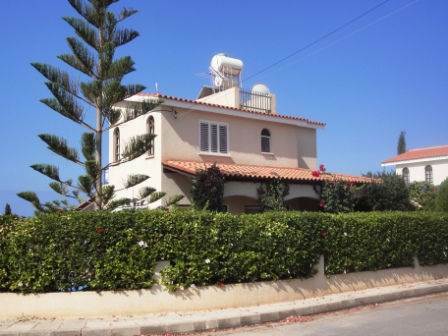 Cyprus Property Blog by Cleo : New Listing - Villa in Prime Location in Coral Bay - NOW SOLD! • 2 bath, 2 bdrm 2 story - €280,000 EUR - Walk to Coral Bay Beach - NOW SOLD! Coral Bay, Paphos, Cyprus - This beautiful 2 bedroom detached villa is located in a quite residential road in the prime location of Coral Bay. All the amenities and activities such as beaches, restaurants, shops and bars in Coral Bay are within walking distance. The ground floor features a guest cloakroom and spacious open plan living room with lounge, dining area and corner kitchen, Patio doors make this area a wonderful light and airy space, and provide easy access to covered verandas on both sides of the property. Upstairs there are two large double bedrooms with fitted wardrobes, shutters and patio doors leading to a good size balcony with lovely sea views. The master bedroom has an en-suite shower room and there is a large family bathroom opposite the second bedroom. The plot is well designed with mature landscaped gardens providing lots of colour and complete privacy. The pool terrace has plenty of sun, and the shaded verandas offer a wonderful place for outdoor dining and relaxing. At the entrance is a driveway with carport which has space for two cars, and useful storage space. The property is ideal for use as a holiday home or for permanent living. It has been an excellent business investment for the current owners, who are successfully renting the villa to holiday makers (more information on this can be obtained on request). The property is maintained to an excellent standard.